"I think you're a selfish, petty egomaniac who would see his mother burned at the stake if that were the only way he could light his cigarette!" 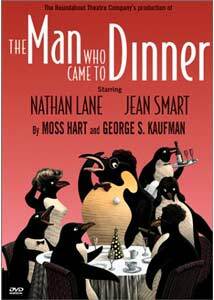 Moss Hart and George S. Kaufman's The Man Who Came to Dinner, first performed in 1939, is a classic of the American theater, and has been performed countless times over the years. This adaptation, presented as part of PBS' Stage on Screen series, stars Nathan Lane as the acerbic radio personality Sheridan Whiteside, along with Jean Smart (from TV's Designing Women) as the man-eating actress Lorraine Sheldon, and Harriet Harris (Frasier's diabolical agent from Frasier) as Whiteside's long-suffering secretary, Maggie Cutler. The play is a comic delight, with frequently hilarious one-liners, and the performances are uniformly good, with Nathan Lane's witty bitchiness standing out in particular. Harriet Harris is perfect, convincingly portraying Whiteside's longtime confidante, and the disappointment she suffers once she discovers his plan. Jean Smart plays Lorraine Sheldon as rather loud and coarse, but since the character is a social climber from a small town, it fits. The performance was originally broadcast live, and Liam Neeson and Natasha Richardson (apparently suffering from a case of lockjaw) provide a variety of historical information about the play, the revival of New York's 42nd Street theater district, and the Roundabout Theatre Company between the three acts. The most interesting tidbits are about Hart and Kaufman and the writing of the play, whose characters were based on well-know personalities of the time, such as Alexander Woollcott, Noel Coward, and even Harpo Marx! Image Transfer Review: Taken from video, the image is colorful and clear, although quite soft at times. Detail is lacking, and occasionally "jaggies" are seen on moving horizontal lines, especially during the intermission sequences. Audio Transfer Review: Since this DVD is taken from a live theatrical broadcast, one wouldn't expect much in the way of a sonic spectacular, and indeed that is the case here. Although in stereo, there is little separation in the channels. However, the dialogue is always crisp and clear, and the audio is perfectly serviceable for a play. Extras Review: The interesting printed insert explains the genesis of the play and provides background information about its authors, notes on the movie version filmed in 1941, and the performance seen on this disc. However, the real "extras" here are the intermission bits with Natasha Richardson, Liam Neeson, and others, which are included as part of the feature. A classic of American theater, Hart and Kaufman's The Man Who Came to Dinner is a comic delight, and this performance, from PBS' Stage to Screen series, with its excellent performances, does not disappoint.